In 1951, Bosch introduced its first kitchen machine what is now known as the Bosch Universal Plus Mixer. The mixer has had some style changes over the years (Pictures Coming Soon!) but most attachments would still fit on the current machine. Bosch Mixers are known for their durability and power. While Bosch Mixers were not widely available in the late 60's, many of the machines that were purchased are still in use. The Bosch Mixer is now more available than ever with the advent of the internet, however, these kitchen mixers are still primarily only found in high-end kitchen stores. Bosch Universal Plus Mixer - Model (MUM6*) New! Came to the US market November 2007. *Attachments for the Bosch model UM3 and MUM6*** series machines will still fit this mixer base! For years Bosch has manufactured the most durable & powerfull kitchen mixers available. Many know the Bosch Universal Mixer as the best mixer made. Bosch Has just introduced the brand new Bosch Universal Mixer Plus with many improved features. I know, hard to believe! Power: Now 800 Watts! (was 700) You can tell this mixer mixes the heaviest doughs with ease. Capacity: This 6qt bowl now has a domed lid which combined with the increased power can mix 8 loaves of bread. Ease of Use: The new bowl has a few great new features. Bosch has added a easy to use handle, and the all metal drive shaft is now easily removed with a quick twist for easy cleaning of any mess. Stability: Bosch has added durable suction cup feet that hold the Bosch Mixer to any countertop surface. The bowl also locks on for stability when scouping things such as cookies out. Speed Control: Another great feature is the addition of a 4th speed. The 1st speed now is half the speed of its predicessor. This makes incorporation light ingredients such as flour much easier. The 4th speed is also faster making various attachments such as the blender even more effective than before. The Bosch Universal (Below) is the predicessor to the Bosch Universal Plus (Above). Bosch Universal Mixer - Model (MUM6*) Upgraded to the Bosch Universal "Plus" (See Above) 1984-2007*Attachments for the Bosch model UM3 series Bosch Kitchen Machine will still fit this mixer base! Widely unknown but loved by those who own one of these mixers. Bosch started making this durable mixer in 1952 and the mixer has remained very much the same. Bosch Universal Mixers are known for their bread making ability, In fact, it is without a doubt the best bread mixer available. While it is the Universals' bread making ability that has made a name for itself those who own one of these find it to be so easy to use that they tend to use it more than other mixer owners. In the United States the Bosch Universal Mixer is the most popular of the Bosch Mixers. However ironically the Bosch Compact Mixer is the most popular mixer in Europe even outselling the KitchenAid Mixer. The Universal is great for bread makers, small businesses, families, cookie lovers, and those who want power, durablity and capacity. Also Known as the Bosch Kitchen Machine, Bosch Bread Machine, Bosch Stand Mixer among other names. 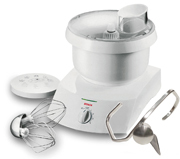 Bosch Magic Mixer - Model (UM3*) Predecessor to the modern Bosch Universal Mixer 1951-1984. *Attachments for this Bosch Stand Mixer will fit the MUM6* Series of mixers! 1951 The Bosch Kitchen Machine changed kitchens everywhere. Cooking formerly done with hard work and manual labor was now being done by the Bosch Kitchen Machine. Especially the very laborious task of bread making (an important staple, especially in the German diet). Kitchen chores were getting done better and faster than ever before. Housewives were experiencing more free time for themselves, and spending less time cooking. In 1960 Bosch changed from a heavy metal casing to a lighter weight polycarbonate housing weighing approx. 12 lbs. this is a mixer that you do not mind getting out of the cupboard. While the Bosch Magic Mixer (comonly known and the Bosch Kitchen Machine, however, I love the name Bosch Magic Mixer as it was know for a period in the 70's) looks vastly different than the MUM6 or Bosch Universal series of Kitchen Mixers, it really is basically the same. The MUM6 gained 150 watts and a new housing / casing giving it a different look, but it still uses the same couplers for bowls, blenders, food processors, slicer/shredders and all other attachments making it easy to upgrade and not have to purchase all new accessories! The Bosch Compact Mixer is the mixer of choice in Europe. Why? The Compact is affordable, compact (small size 4 Qt. Aprox. 10.5" Cube), powerful (for its size - 400w), & durable. Europe has smaller families, and smaller residence which has made this the mixer the europeans choose. This is a more traditional mixer with its overhead kneading arm. Traditional Bosch Universal Mixer owners tend to find this harder to use as the Universal is more open and easier to add Ingredients. This is a great mixer for empty nesters, singles, students and those who want to make small quantities. The Concept Mixer was the next generation of Bosch Mixers, however, this mixer never caught on in the American or European markets. The Bosch Concept Mixer was loved by many who bought this quality mixer, the concept did have an advantage of fitting in a standard kitchen drawer but other than this the concept did not offer any other large advantage to the Bosch Universal Mixer. The Bosch Universal Mixer still offered a more durable and dependable design. The Bosch Concept Mixer is a adaptation of the popular Bosch Universal. The Concept Mixer was designed to fit in a standard kitchen drawer. Users have raved about the quietness and ease of storing this mixer. The concept has many of its own attachments but can utilize any of the Universal attachments with an adapter for those who have owned a Universal before. Unlike the Universal and Compact mixers the Concept has a short history having been around about 15 years. The Concept entered the market approx. 1991 and was no longer widely available after 2006. Currently you would most likely have to look for a used Bosch Concept in ourder to purchase one of these mixers. The attachments for this mixer are still available and look to be available for some time. The Bosch MUM8 Mixer would likely recieve a new name if / when it ever hits the USA. The MUM8 is a versitile mixer with power that no other mixer in the US could touch. With 1400 Watts of power this mixer that is about 7 Qt. would compete with any of the high end mixers on the market today. The MUM8 is also traditional in its design with an overhead mixing arm (similar to Kitchen Aid Mixers, Viking Mixers, Delonghi, etc..) The Bosch MUM8 Mixer with it's uniquely shaped mixing attachments and bowl never leaves ingredients unmixed. Superior Air Flow: Bosch uses superior air flow to keep it's mixer from overheating when mixing. I have actually made a recipe that includes 22 cups of whole wheat flour and 9 cups of water! When you consider the capacity, efficientcy and durability of the Bosch Mixer you can not go wrong with this mixer. The motor on every Bosch Mixer turns a fan that moves air over the motor and venting out the back of the unit which keeps the mixer from overheating when other mixers would otherwise have overheated leaving you little option but to add flour and finish mixing by hand. 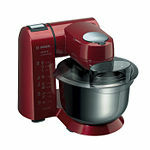 Unsurpassed Power: The current Bosch Universal Plus mixer is 800 Watts (the former Bosch Universal Mixer was 700 Watts). By comparison, the top of the line KitchenAid is 575 Watts. Watts, however, is only an indication of the power of the motor not the power of the mixer. The efficientcy of the transmission is also crucial and the gear reduction will also make a huge difference. Gear Reduction: Mixers use a gear reduction in order to mix heavy doughs or stiff batters. Most mixers will have a gear reduction in the mid 20's to 1 (i.e. 25 to 1) This means that the motor turns 25 times for each revolution of the whip, beater or dough hook depending on what you are using. The Bosch Universal Mixer uses a gear reduction of 73 to 1, nearly triple the competition. What does this really mean? This literally means nearly tripple the power! This is why you can fill a Bosch Mixer with bread dough and mix batch after batch and not have problems with overheating and wearing out the mixer! If you are a bread maker you will love the Bosch Mixer. Triple Arm Dough Hook: Bosch Universal Mixers utilize a dough hook with three arms which are bent in such a way that it moves dough efficiently from the bottom of the bowl to the top of the bowl and from the inside to the outside and back to the inside again. It may actually look like the dough is just spinning around, when in reality the dough hook is really doing a great job of pulling, stretching and kneading gluten to form strong elastic strands needed to make a tremendous loaf of bread quickly and effortlessly. First of all to sum up the Bosch Mixer is my personal #1 item for the kitchen! My #2 is a set of Wusthof Knives and #3 is a good Pressure Cooker (I love Kuhn Rikon). I would love to go on but this page is about Bosch Mixers. To replicate what I do in my mixer would be exceedingly difficult, that is the basis of why I love this mixer so much. I primarily use this mixer to make bread but will also mix and or whip: cookies, cakes, frosting, pie crust, pasta dough, pancake batter, waffle batter, whipping cream, egg whites, mashed potatoes and even shred chicken! The possiblilities are seemingly endless. When I use other mixers, the first thing that I dread is how difficult it is to add ingredients into the bowl. The two part lid on the Bosch is so easy and gives more than ample room to add ingredients. Most customers that I have interacted with that have previously used a Kitchen Aid have liked this as well but expressed that they actually liked how well the bosh mixer cleaned the bottom of the mixing bowl. Power - it's probably a guy thing, but I love that I can mix up to eight loaves of bread and this mixer is built to knead that much dough (by the way that is 24 cups of flour, which is why some people call this the Bosch Bread Maker even though it is really a complete mixer. Whipping - With its dual whipping system more air is incorporated faster. The whips are made to touch the bottom of the bowl so you whip every last bit of egg whites, cream or whatevery you are working on. Versatility - You can do so many things with this mixer. The Bosch Kitchen Mixers have more attachments than any other mixer available. I will list a few: Blender, Slicer/Shredder, Food Processor, Citrus Juicer, Meat Grinder, Grain Mill, Oat Flaker, Pasta Maker, Fruit/Berry Press, Cookie Pastry press among a few others. Hi, Just wanted to let you know that I am totally enjoying my Bosch mixer (MUM66SSDB) ordered from your store last December and just recently some accessories for the mixer. I have been meaning to let you know how completely satisfied I am with the Bosch mixer but I have been too busy making bread for the whole family! Since getting my new mixer I have sold my KitchenAid Pro Line series stand mixer and my blender as well. You were right when you said that I would not want to use anything else after using the Bosch mixer! This mixer is absolutely fabulous and it makes bread in no time at all, half the work, makes my life much easier. So, thank you very much for the help and info over the telephone conversation we had back in December and I must add that your service is ecxellent. Hi, I just want to thank you so much for my mixer. It isn't quite as big or heavy duty as I was hoping, but later on I will afford the more expensive one. But this one does do everything you said it will do. I love making bread. I have only tried making one loaf at a time so far, but the machine mixes the dough much better than the old cheap bread machine I had did. It comes out so smooth. I don't have the physical strength to knead by hand. I don't have to tell you that it cuts time kneading time in half. It also keeps my arms and back from hurting like before. Hi Folks, Just a note to let you know I got my new tools in good order Friday, and I love them! The mill in particular is brilliant, and I've never seen anything like the flour I'm milling. I don't ever want to go back to store bought flour again. The mixer is everything I would expect from Bosch, having used their power tools for many years as a builder. It's clear I'll be using this machine for decades. The Kernel of Wheat is a vital storehouse of nutrients and unabsorbable fiber (roughage needed and used by man since the dawn of civilization. The cross-section illustrates, and the accompanying test describes, the nutrient and roughage (fiber) content of each part of the kernel. The nutrients listed are considered essential in the diet, and "An impressive array of evidence has been brought to light and pieced together by many researchers to show great importance to health of a hitherto neglected component of human food, the unabsorbable fiber, or roughage." "The greatest single cause of iron deficiency, anemia, is the refining of breads, cereals, and sugar. Now that our breadstuffs are refined, no food rich in the B vitamins is ordinarily eaten daily." BRAN: These outer layers of the wheat kernel (about 14.5% of the Kernel) are included in whole wheat flour but removed in the refining process during which white flour is extracted. "Where you now use white flour and products made with it, use instead as much as possible, true whole-sheat flour, whole wheat, or whole rye is 100% extraction." "The major diseases filling up the beds of hospitals are preventable," Dr. Dennis Burkitt said. "They include coronary heart disease, large bowel cancer, appendicitis, gallstones, diverticualr disease, diabetes and hemorrhoids." "the major dietary differences between developing countries that don't have these diseases and civilized ones that do is the percentage of fiber in the diets." What's the best way to increase fiber in the diet? "Eat three times as much whole grain bread as you do now. Breads made with high fiber are immensely good." and 8% of the protein. "So called 'enriched' flour is my idea of outright dishonesty; at least 25 nutrients are largely removed during refining and one-third the original amount of iron, vitamin B-1, and niacin may be replaced. Such flour is 'enriched' just as you would be enriched by someone stealing 25 dollars from you and returning 99 cents."